September has now come and gone and Fall is officially here no matter how you measure it. We’ve already had several Fall fronts move through with chilling winds and deep blue skies. Heat will become more and more fleeting as the leaves turn and fall. This month’s behind the forecast will look at the processes behind some Fall phenomenon. How does frost form? What do frost advisories and freeze warnings mean and why don’t we have them all Winter? 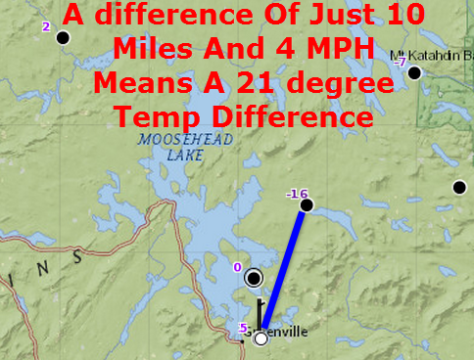 Why do low elevations cool off faster than high elevations? How does that influence the development of valley fog? The answers to those questions and more are below. Frost is a staple of Fall. Gardeners dread it’s arrival, marking the end of the growing season, while Fall and Winter enthusiasts welcome it’s announcement of the coming chill. Frost forms when two conditions are met. The temperature must be pretty close to the dew point at the surface, meaning that the air is cold enough for the moisture contained inside it to condense. Also, the temperature must be at or below freezing (32F or 0C). When the air is both subfreezing and saturated, water vapor will condense onto grass, leaves, cars, etc. and freeze into ice crystals, forming frost. Frost happens almost exclusively in the Fall because there’s more water vapour in the air. That means temps don’t have to fall as far for the air to become nearly saturated. Of course the air is much colder during the Winter but air that cold doesn’t hold as much water vapour. By the time the moisture returns in the Spring, temps are too warm. This means that the first frost is a fairly accurate marker of the first time temps get down to freezing. When temps approach freezing, garden plants can be harmed or even killed which is why the National Weather Service (NWS) has a whole system of warnings and advisories to let people know if they need to take action to protect their plants. A frost advisory means that patchy frost is likely and that temps in sheltered areas could approach 32 degrees. Any sensitive plants should be protected, but the growing season will keep going even after a light frost. A freeze warning means that nearly everyone in the warning area will see temps below 32 and that any non-native plant should be protected or taken inside. After one or two hard freezes, the growing season is declared over. Frost and freeze advisories and warnings are only issued during the growing season which generally begins in May and lasts through the first hard freeze which averages late September in the mountains and early to mid October closer to the coast. The average first freeze in Portland is 5th October, but recently the trend has been for a later and later first freeze as the climate warms. After the first freeze, the NWS stops issuing frost/freeze products because that would just add clutter to forecasts during the Winter months when the temperature is almost always subfreezing. Early in the Fall season, no amount of thermal advection (cold air moving in from Canada) can drop the temp to freezing. The first subfreezing reading and subsequent frost/freeze almost always occurs due to radiational cooling. Radiational cooling happens when more radiation is emitted into the atmosphere than is gained from the sun. Because no energy is gained from the sun during the overnight hours, radiational cooling is generally a nighttime phenomenon. For optimal radiational cooling, two things must be true. The sky must be clear and the winds must be calm. The sky must be clear because if clouds are present, the radiation emitted from the layer of air right next to the earth’s surface (the boundary layer) will bounce off the cloud and come right back down the ground, keeping things warm. Why winds must be calm is a lot more complicated. During the day, the sun shines on the earth’s surface. Radiation from the sun is absorbed by everything on earth. Which radiation is absorbed and which is reflected back out into the atmosphere determines colour. White light is all the colours combined. The chlorophyll in leaves, for example, absorbs all the colours except green. This means that green light is reflected into the atmosphere for our eyes to pick up. It also means that the energy from all the other parts of the visible light spectrum is stuck in the leaf. When the leaf gets that extra energy, it heats up and some of that heat is emitted into the atmosphere. This process, on a planetary scale, is why the temperature rises during the day. Of course, temps rising during the day is not a hard and fast rule. If there are strong winds off the water, low clouds, or a cold airmass moving into the area, the temperature might not rise at all because the warming effect of the sun is overridden by the cooling effect of the clouds or the thermal advection of cold air from the water. After all that talk of radiation, colours, and diurnal temperature processes, at the end of the day the heat in the atmosphere is generated at the surface and that’s what matters because as soon as that heat source is taken away at night, the boundary layer is the quickest to cool. This means that there is a shallow layer of cold air at the surface with warm air aloft. If there are winds present, the warm air aloft will be mixed down the the surface and the temp won’t be able to cool as much. 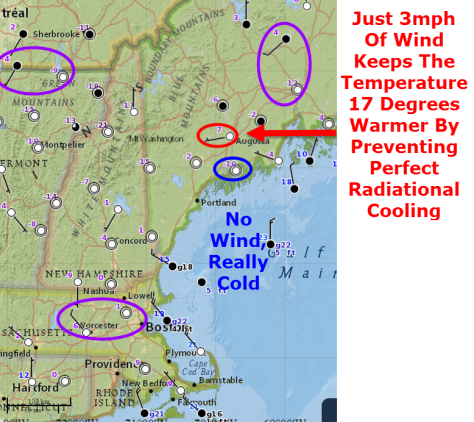 That is why you need calm winds for good radiational cooling. This process also explains why low elevations are colder during radiational cooling events. Winds generally increase with height because of decreasing friction. At the surface, winds are slowed down by trees, mountains, buildings, etc. Aloft, there’s nothing to stop them. Higher elevations poke up into these higher winds to varying degrees. Mt Washington sticks way up into the region of the atmosphere with high winds and therefore routinely sees gusts over hurricane force, even while the rest of us may only see light breezes. The same phenomenon occurs at a smaller scale with lower elevations. The top of your local hill may see winds of 5 m.p.h. while the dip nearby may be dead calm. When it comes to radiational cooling, that can make all the difference. ​Now that we know that lower elevations can be dramatically cooler than higher elevations, we can explain valley fog. Unlike temperature, the dew point changes little with radiational cooling. The lower temps in the valleys will achieve saturation (temp = dew point) before the surrounding air does. This process creates layers of fog that only extend to certain, often very low, elevations. This creates some awesome effects when you can stand on a modest sized hill and look down on the tops of clouds (fog is a cloud that touches the ground). 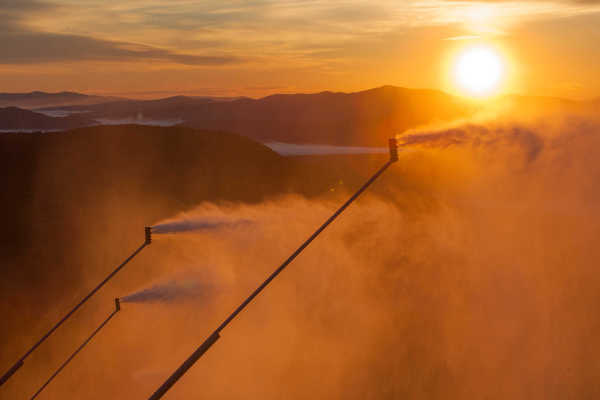 I’ve included a picture from the recent test of Sunday River’s snowmaking system which not only features snow in September, but also some cool valley fog in the background. This process can also work on a smaller scale over fields. Plants release moisture into the air through a process known as evapotranspiration (corn sweat if you’ve ever been to the Midwest). If plants release enough moisture, it can raise the dew point so that in that area the air can become saturated at a higher temperature causing localized fog. This phenomenon is so small scale, if you walked into a field when it happens, more often than not your feet would be in the fog while your head would be in the clear. Try it out sometime! Now you know the science behind some of the most common fall phenomenon here in Maine. Frost happens when moisture cools, condenses and freezes. To get subfreezing temps for frost early in the season you need radiational cooling which works best with clear skies and light winds. The hyperlocal variations in winds due to elevation will create similarly small scale temperature changes that, given constant moisture, can result in local field/valley fog. Next month’s column will likely look at the winter outlook. October can be key in figuring that out because it is the time during which Siberian snow cover either develops, or doesn’t, resulting in a chain reaction that can greatly influence our winters especially in the absence of a strong ENSO (El Nino/La Nina) signal. More on all that in November. Each month I explain a couple of terms so that you don’t feel like you’re helplessly swimming in an ocean of jargon while reading weather reports, either mine or those done by others. This month’s terms are to get you ready for the Winter outlook that will be presented in next month’s column. SST’s - Sea Surface Temperatures. Sea surface temperatures will be important when we discuss the Winter outlook. Areas of abnormally warm or cold water at the surface of the ocean half way across the world can be critical in determining the Winter pattern here. The staying power of SST patterns are determined by the subsurface ocean temps. If the subsurface ocean temp pattern match the SST pattern, it will likely stick around. Trouble can arise when sub-surface temps don’t match SST’s and the SST pattern can be tempered or even reversed as that water gradually makes its way to the surface. Teleconnection- A teleconnection is a connection between the weather someplace far away and the weather here. They’re often an alphabet soup of acronyms- BSR, EAR, NAO, AO, AAO, PNA, PDO, ENSO, QBO, EPO, WPO and the list goes on. They can be used to predict the weather days or even weeks in advance without models or computers that are subject to inconsistency and error. Notice how most of them end in the letter “o”. “O” stands for oscillation because most of the teleconnections oscillate between positive and negative phases with at least some regularity.